Hillcrest residents in the St Machar area of Aberdeen will soon be able to relax in a brand new community garden, after a design competition was won by a talented RGU architecture student. The competition was run by INsideOUT and featured a brief of designing a community garden with a focus on biodiversity and community engagement. The garden will be located on the site of Hillcrest Housing Association’s St Machar Road development of 138 affordable homes, which is currently under construction. Architecture student Rebecca Hawley shows her winning design. Rebecca Hawley, a second year architecture student at RGU’s Scott Sutherland School of Architecture and Built Environment, was picked as the winner by a panel of judges for her design ‘Urban Woodland Rounds’. Rebecca’s design creates a link between the site’s urban surroundings and a calming woodland setting and acts as a focal point within the community for interaction and education. Taking inspiration from the shapes and curved lines of natural woodland features combined with the straight sharp lines of urban settings, Urban Woodland Rounds sees winding paths, woodland plantings and circular social areas interacting with straight sharp lined vertical and horizontal elements. Rebecca commented: “Following meetings and talking to a few members of the community the conclusion was made that more community interaction was needed. 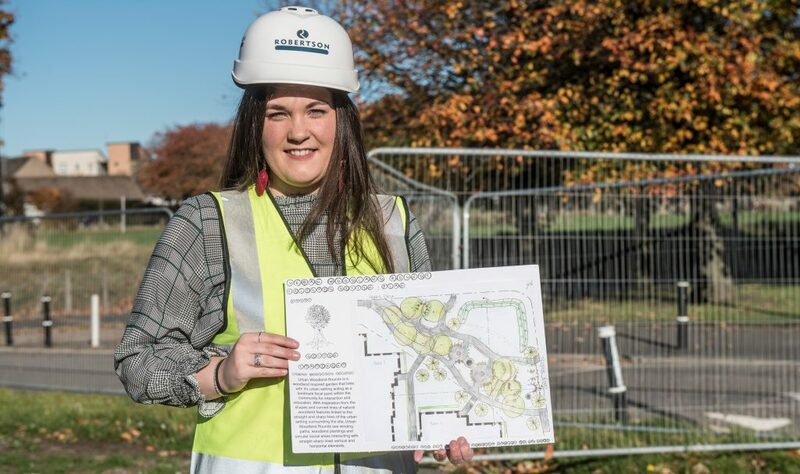 “It was in the community’s interest that a play area was added for younger children who will benefit from scattered fairy gardens and educational hubs which will house a bee and butterfly garden and bug hotels. She added: “The experience is surreal, and it hasn’t quite sunk in yet that what I have been designing and drawing on paper all summer will be brought to life. I am over the moon that my design has been chosen after being given the opportunity that not many people in their early stages of their architectural education have been given. David Zwirlein, Hillcrest Director of Development and New Business, added: “After a number of months of hard work, Rebecca has produced a tremendous design that certainly ticked all of the boxes of the design brief. Once completed, the design will form a landmark within the community and isn’t just a fantastic piece of art, but also a place where Hillcrest residents and the wider community can meet and interact.